1. The sag wagon (of death). No doubt, this is the first thing that would kill me. I wouldn’t last one stage on the Tour. Actually, the first stage is a time trial and there’s no sag wagon there. But on this year’s stage two, I’d have been swept up pretty quick. The average speed of the lanterne rouge (the slowest rider in the Tour) was 38.4 km/h, which equals 23.8 mph. That’s in 21 days of riding, which included 2150 miles and 90 hours for the slow guys. 2. The peloton. What do you get when you combine claustrophobia and poor bike handling skills? Me. 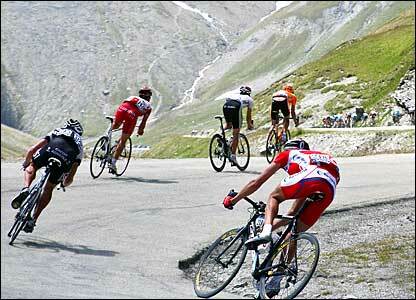 Causing a huge crash in the middle of the peloton. I’d hit someone’s back wheel 10 minutes into the first ride. 3. Hairpin turns. And road furniture. If I didn’t take out myself and dozens of others by my nervous pack riding, I’d definitely eat it at a) a traffic circle, b) a curb, c) one of those crazy 180-degree turns like the one on the Champs Elyse circuit. Every time the peloton rounds that thing, I think someone’s going to crash for sure. 4. Descending. I’m pretty conservative going downhill. I got up to 48 mph once and it scared me. Add in some switchbacks and a road without shoulders, and I’d be the fastest guy down the hill. Only problem is I’d arrive without my bike and without an intact bone in my body. 6. Mont Ventoux. Or whatever ridiculously hard mountain stage they throw at you on the last day of racing. The headwinds up there were 25 mph, which would have reduced my net speed to -15 mph. 7. Jens Voigt’s crash. It didn’t kill him, but that’s because the hardest substance on earth is Jens Voigt. I would have died. 8. Thor Hushovd’s near-crash. Another instance in which I’d lack the necessary skills to not die. 9. This podium girl. Ouch! 10. The Schleck brothers. By my count, Andy’s total number of attacks in the Alps: 13.